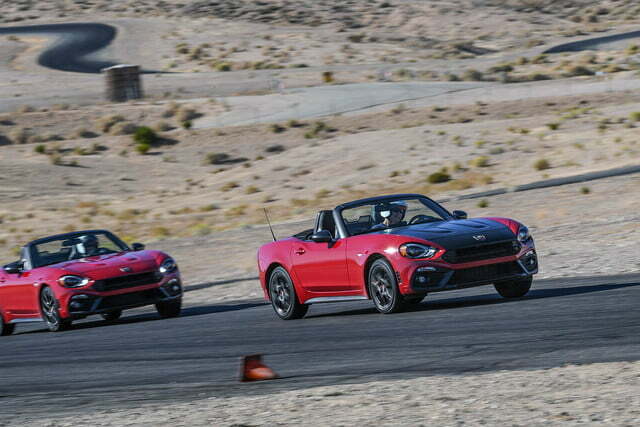 The Fiat 124 remains a very compelling sportscar, but the Mazda MX-5 continues to gain ground. Two years ago, we hopped behind the wheel of the 2017 Fiat 124 Spider and embarked on a road trip from Los Angeles to Pebble Beach for Monterey Car Week. 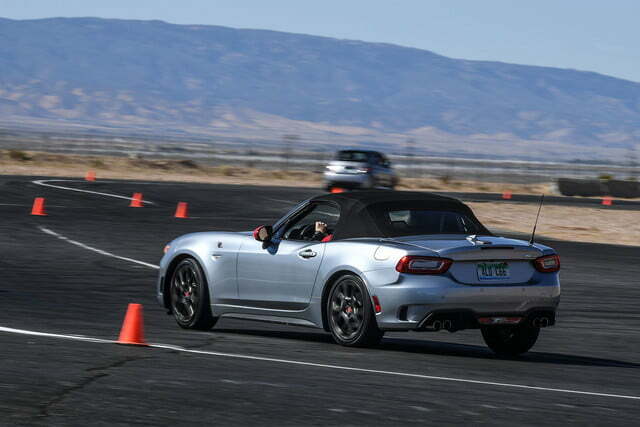 Logging more than 700 miles with the Fiat over the course of a few days gave us a chance to really get to know all the ins and outs of the car, along with how it differed from the fourth generation Mazda MX-5. 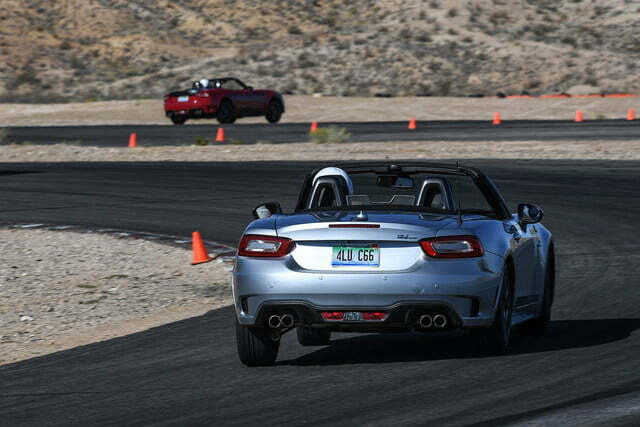 Even today, it’s difficult to discuss the 124 without mentioning the Miata in the same breath. While the Fiat wears an Italian badge, the two cars are built on the same production line at Mazda’s Hiroshima assembly plant and share quite a bit of mechanical DNA. But upon its debut, the 124 offered a compelling alternative to the MX-5 not only because of its Italian bodywork, but because of its Fiat-sourced, 1.4-liter turbocharged MultiAir engine. 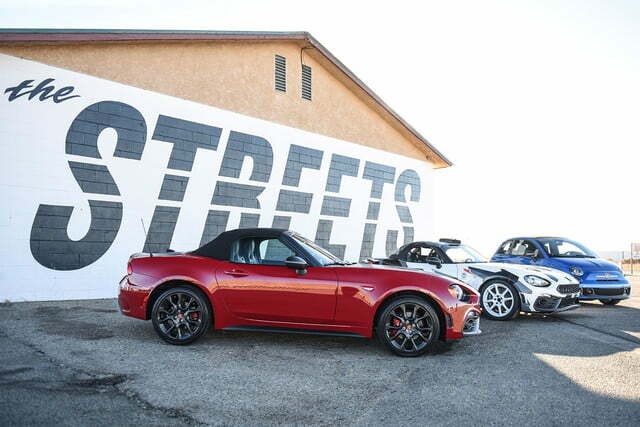 Offering up to 164 horsepower and 184 pound-feet of torque in the performance-tuned Abarth trim, the 124 Spider’s boosted power plant offered a tangible and compelling alternative to the naturally aspirated two-liter under the hood of the Mazda, which delivered 155 hp and 148 lb-ft. of torque. But that was then. Mazda’s engineers have spent some time revising their four-pot in the time since, and the powerplant now delivers 181 hp and 151 lb-ft., and the mill now revs all the way to 7500 rpm. While that might not have wholly reinvented the 2019 Miata, it does offer something more for sports car cross-shoppers to ponder. 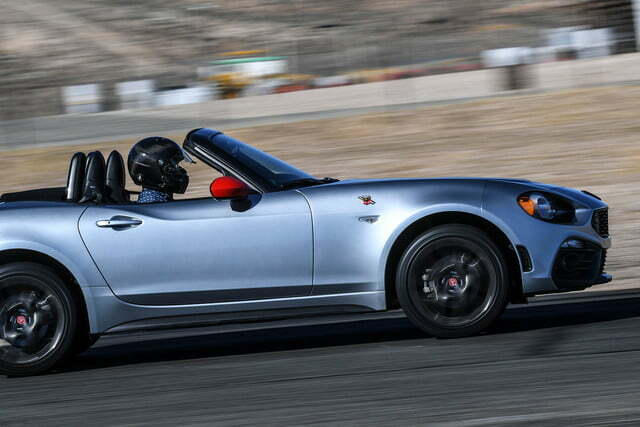 The Fiat 124 Abarth’s competition isn’t exclusively relegated to its Japanese cousin, either. Like the 124 and MX-5, the Subaru BRZ and Toyota 86 are the results of a shared effort between the two automakers to develop rear-wheel drive, budget-friendly sports cars which share their mechanical underpinnings while offering a compelling driving experience that’s unique to each brand. Starting at $29,290 in Abarth guise, the Fiat 124 hasn’t been reinvented for 2019, but there are a few worthwhile changes on hand. Those include a switch to turbocharged power across the model lineup, along with new options like the Record Monza performance exhaust system and various appearance tweaks. 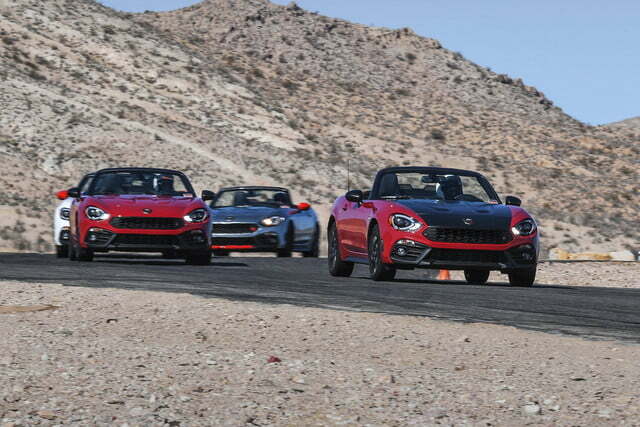 Can the performance-tuned Fiat continue to hold its ground in face of rising competition? We headed to Willow Springs International Raceway in Rosamond, California, to find out. Apart from newly-available options packages like the Veleno Appearance Group – which adds red exterior accents and a few upgrades to the cabin – the exterior of the Fiat 124 Abarth remains ostensibly unchanged from its debut in 2016. That’s not necessarily a bad thing though, as the 124’s retro-inspired design gives the drop-top a distinctive style that still remains unique today. 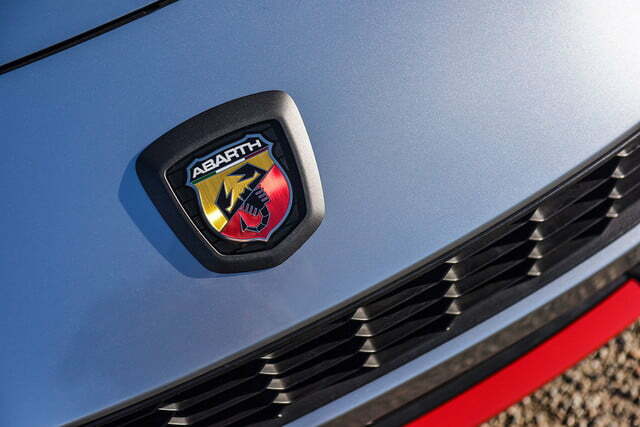 Opting for the Abarth trim brings with it a number of upgrades that include 17-inch aluminum wheels, a mechanical limited-slip differential, a performance-tuned suspension with Bilstein monotube shocks, quad-tipped sports exhaust, unique sport seats, and raft of Abarth-specific aesthetic tweaks inside and out. 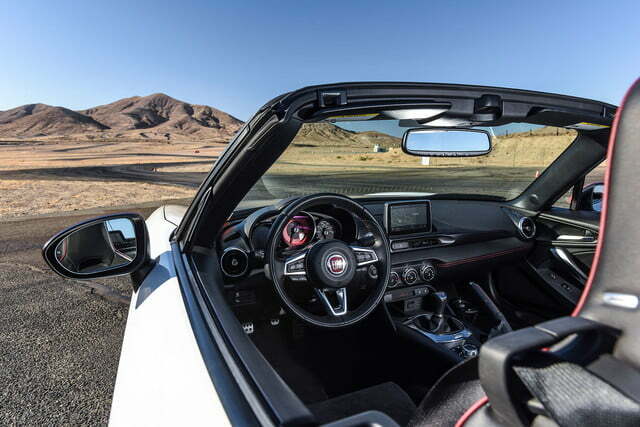 While the cabin doesn’t stray far from the fourth generation Miata’s layout, Fiat and Abarth have applied their own touches here as well, adding some Italian flair by way of contrast stitching and a reworked gauge cluster. A 7.0-inch Fiat Connect touchscreen infotainment system with a back-up camera is outfitted as standard, as are heated seats in Lusso and Abarth-trimmed models. However, it’s worth noting that the optional Recaro sport seats provide excellent lateral support while remaining well-padded and comfortable during extended stints behind the wheel. We preferred those to the standard Abarth buckets. Dropping the top remains a nearly effortless task, and the simplicity of the operation invites you to do so frequently. Dropping the top remains a nearly effortless, one-handed task, and the simplicity of the operation invites the driver to do so frequently. Although a lightweight cloth top can only do so much to curtail road noise at speed, it’s aided by an acoustically-treated windshield and additional sound deadening to help keep the racket at acceptable levels – and noticeably lower than its Mazda-badged counterpart. Two-seater ragtops aren’t typically known for their roominess or storage capacity, but the 124 does boast best-in-class cargo room at 4.94 cubic-feet, while head and legroom are surprisingly ample for taller folks like your author. Our seat time in the 2019 Fiat 124 Spider Abarth was exclusive to the various performance driving exercises that the folks at Skip Barber Racing School had set up for us on and around the Streets of Willow road course. Driven back to back with the Fiat 500 Abarth – a model which is motivated by the same engine and has a nearly identical curb weight – highlights the brilliance of the 124 Abarth when driven with sporting purpose. While the rear-wheel drive layout gives the 124 an obvious advantage right out of the gate, it’s the chassis balance that’s perhaps most striking, aided in no small part by the near 50-50 weight distribution with a driver on-board. 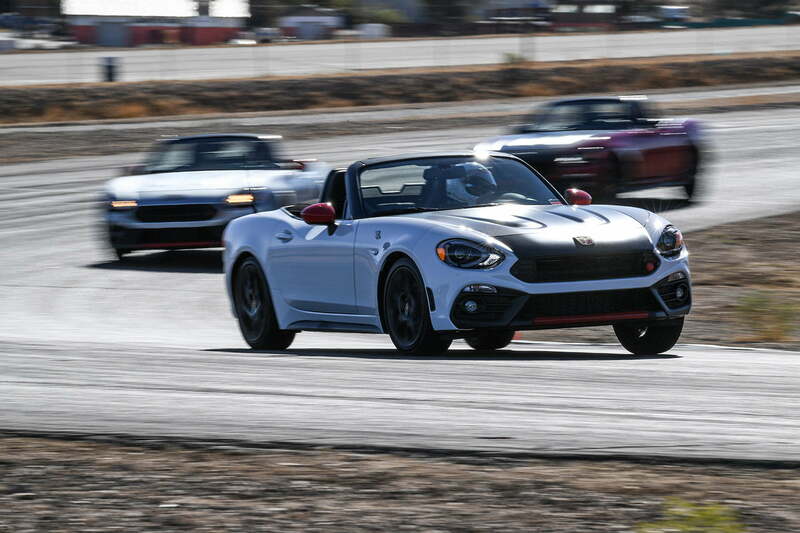 The Abarth loves to dance, and slightly more aggressive suspension tuning that Abarth engineers applied here versus Mazda’s tuning for MX-5 Club curtails a noticeable of the body roll exhibited by the Japanese sports car, and that in turn bolsters driver confidence at the limit. Truth be told, we’d prefer even flatter handling than what the 124 Abarth offers, and we’d be willing to give up a little bit of suspension compliance to get it. It’s the chassis balance that’s perhaps most striking, aided by near-perfect weight distribution with a driver on-board. A Sport Mode selector on the center console also helps differentiate the driving experience from the Miata, dialing up the throttle sensitivity and steering weight while loosening the reigns of the stability control system. However, when really pushing the car, some drivers may find the electronic nannies to still be a little too invasive for track use, even when Sport Mode is active. But disabling traction and stability control is as simple as the push of button, and doing so enhanced both lap times and fun factor in our experience. 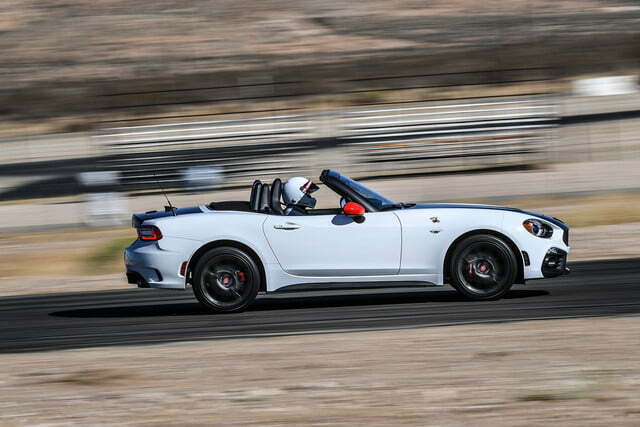 High horsepower cars can be handful on track when you tell the electronics to take the night off, but in a car like the 124 Spider Abarth, it just allows the chassis to display its true character. And that’s a wonderful thing. 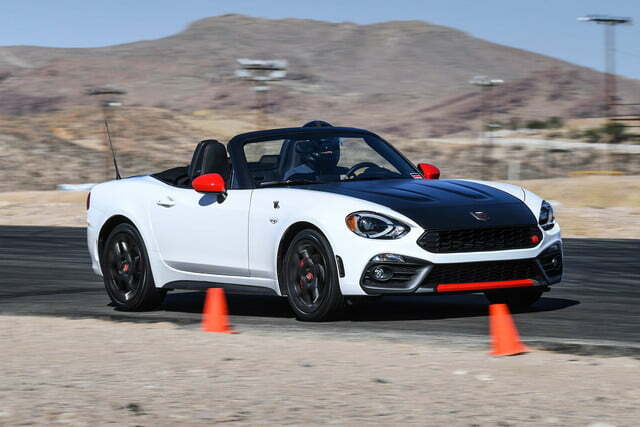 Fiat offers a four-year, 50,000 mile basic warranty, a four-year, 50,000 mile powertrain warranty, and a 12-year, unlimited-mileage warranty against corrosion on a new 124 Spider Abarth. Four years of roadside assistance is also included. 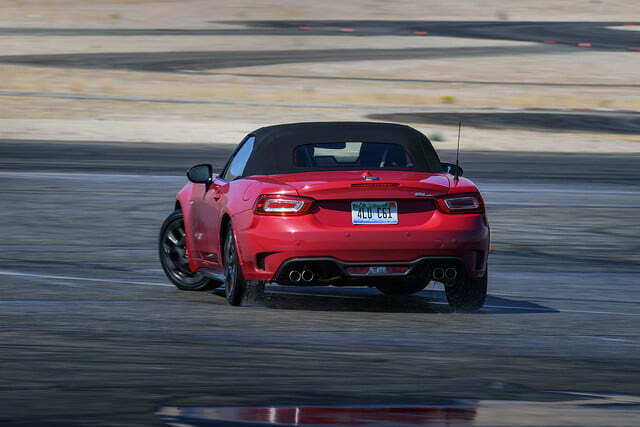 The 124 Spider Abarth is a standout on a road course, so track capability would be our top priority. Accordingly, the Recaro sport seats and optional Brembo front brakes are a must. We’d consider the Record Monza exhaust to be essential as well, not just for the snarl but because we noticed it can be difficult to hear the engine revs over wind and road noise at speed with the top down. When swapping gears manually it required us to take our eyes off the road to look at the tachometer more often than we would have liked, so an authoritively loud exhaust system serves more of a purpose than just bumping up the cool points in this situation. Most examples of 124 Spider Abarth are going to spend plenty of time on public roads as well, so it’s important not to forget about the creature comforts, too. The optional nine-speaker Bose premium audio system would be well worth the weight penalty to us, while the optional adaptive LED headlamps that are included as part of the Visibility Group package enhances safety and visual appeal with no drawbacks other than a thinner wallet. The Fiat 124 Abarth was a great sports car when it debuted in 2016. The problem, however, is that it remains almost unchanged today while its rivals continue to refine their offerings – Subaru recently debuted the Performance Package as well as the STI-tuned tS model for the BRZ, while Toyota recently unveiled a TRD-tuned iteration of the 86 that ostensibly mirrors Subaru’s Performance Package for the BRZ. 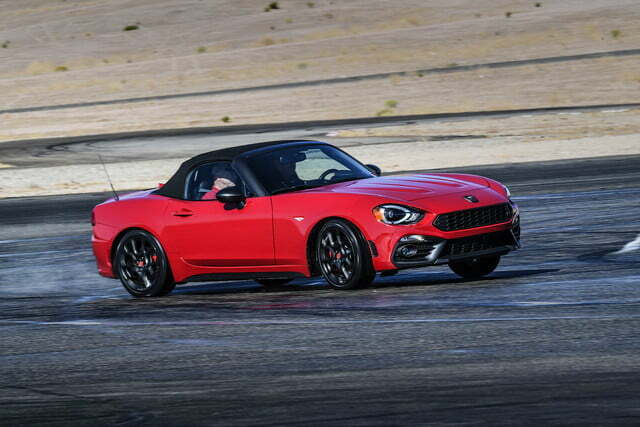 But as nimble and capable as the 86 and BRZ may be, they’re notably larger and heavier than the 2,500-pound Fiat 124 Spider Abarth, and that makes the Fiat’s Japanese cousin the primary competition. The Mazda MX-5 is even lighter than the Fiat by about a hundred pounds, but in years past, the 124’s turbocharged powerplant helped to even the score. However, now that the MX-5 has received the aforementioned engine updates for 2019, the value proposition offered by the Fiat has become less clear. While the boosted Fiat mill still offers an additional 33 lb-ft. of torque compared to the MX-5’s naturally aspirated two-liter, it’s now down 17 hp to the Mazda. 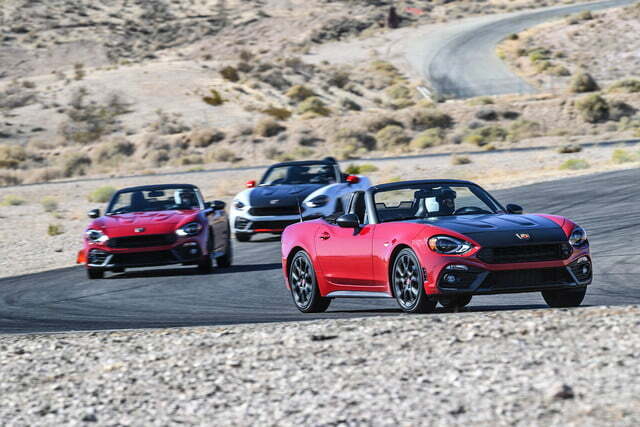 Power plants aside, the reality is that neither the 2019 Fiat 124 or the 2019 Mazda MX-5 are wildly different from the machines they were a few years ago. But the fact that Mazda continues to develop and hone its sports car, while Fiat seems to be content to simply maintain pace, may prove to be the deciding factor for many cross-shoppers.